Green Car Guide has been searching for cars that deliver a combination of a great driving experience and efficiency since 2006. Porsche has actually ticked both of those boxes for many years, but the efficiency of the majority of its cars isn’t the sort of efficiency that is recognised by government low emission vehicle policies. With official emissions of just 79g/km CO2 and a 22 mile electric range, the Porsche Cayenne S Hybrid allows the school run to be completed with zero tailpipe emissions, so helping to address local air quality issues. 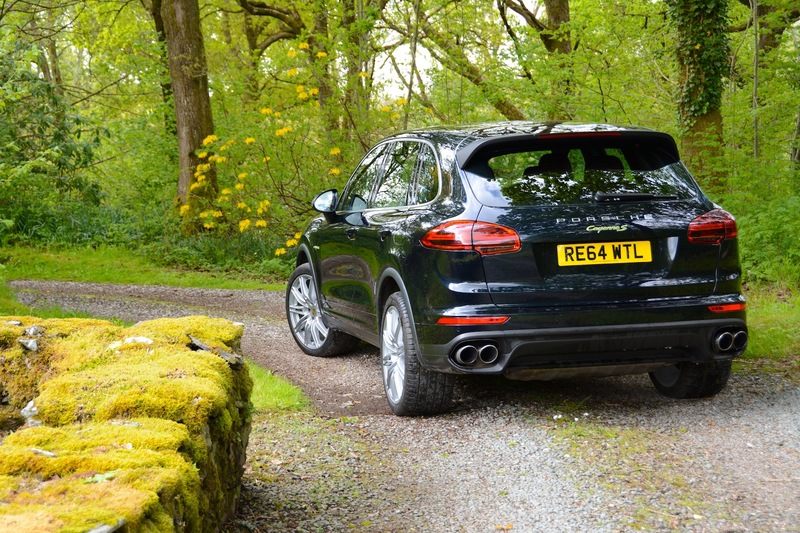 Out of urban areas, the Cayenne delivers everything you’d want from a Porsche SUV – so surely this is one of the ultimate green driver’s cars? 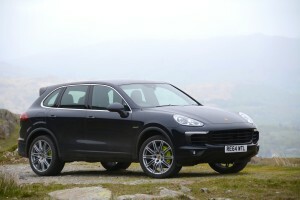 The Porsche Cayenne S Hybrid has a 3-litre V6 petrol engine mated to an electric motor which is powered by a battery. 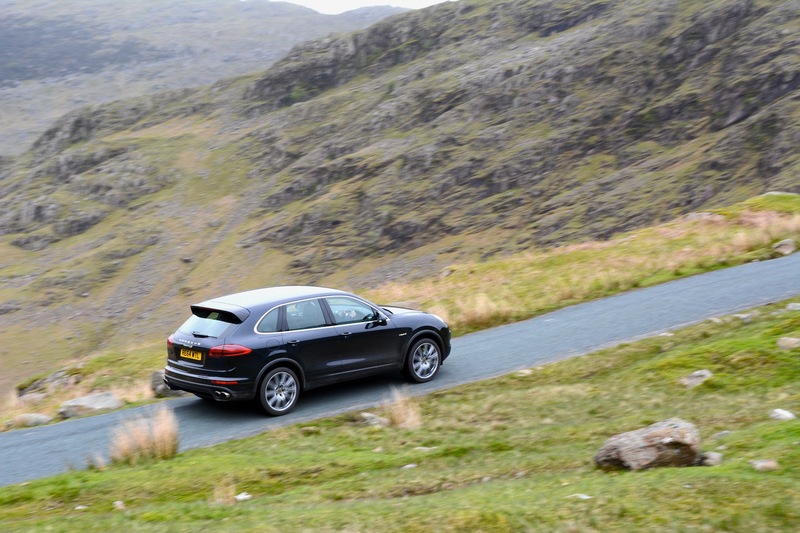 Unlike the previous Cayenne Hybrid model, this time the battery can be recharged by plugging it in to the mains. This gives an official all-electric driving range of 22 miles. Another outcome of the two powertrains is a useful combined torque figure of 590Nm. Drive is transmitted through an 8-speed Tiptronic S transmission. You also get four-wheel drive. 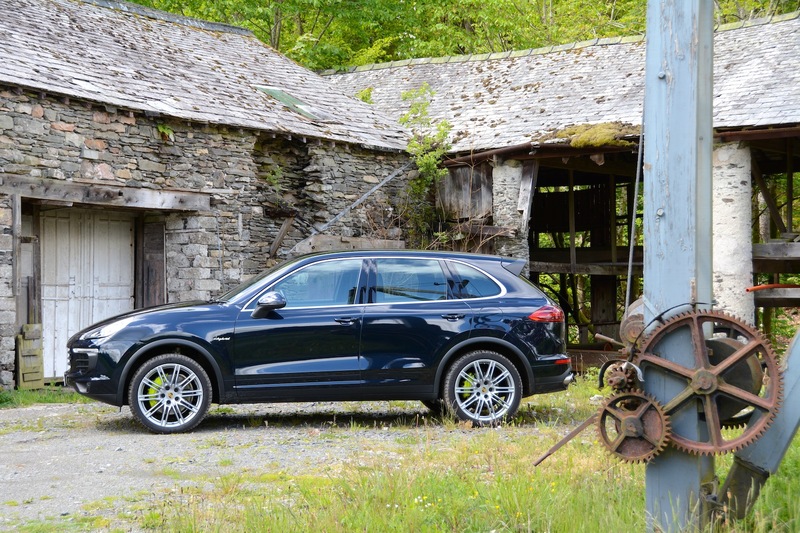 The exterior design of the Cayenne has evolved successfully since it was first introduced into styling that is now altogether more sophisticated and sleek. 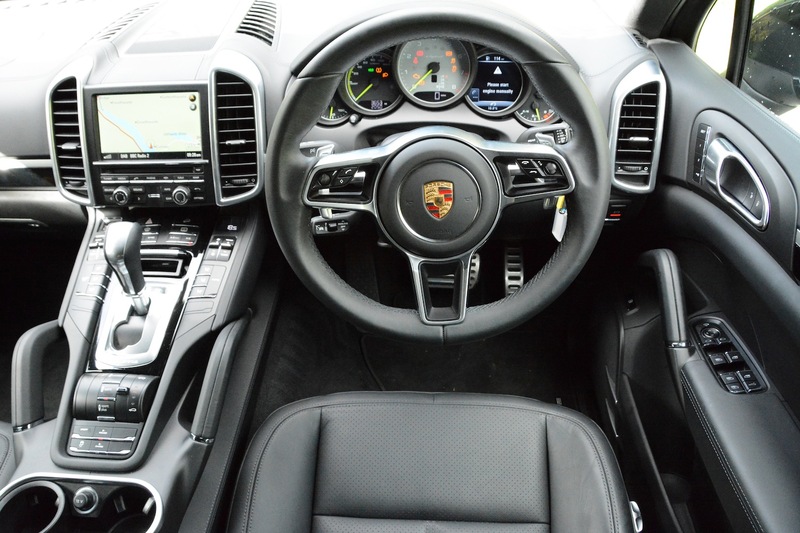 The interior feels very Porsche-like – with lots of buttons everywhere. 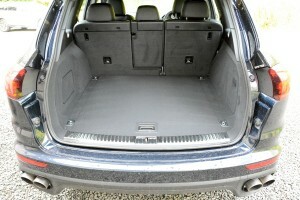 There’s plenty of space inside, including in the boot. No SUV weighing 2,350kg should drive this well. 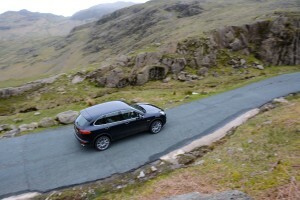 The expectation is that the Cayenne will feel big and heavy to drive, especially when cornering. However instead it feels tight, with excellent body control; it gives the impression of being much smaller than it is, with no pronounced roll when cornering. Things start off well with a good driving position, and a steering wheel with spokes that you can wrap your hands around – an increasingly rare commodity these days, as steering wheel spokes are becoming filled with a whole range of switches and buttons. This encouraging start continues with steering feel, which is excellent, as are the brakes – which is a worthy accomplishment in itself with a hybrid powertrain, where the brakes have to alternate between mechanical and regenerative actions. 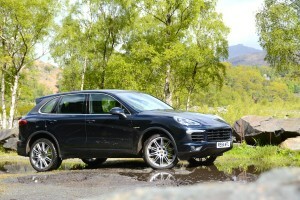 The Cayenne is also comfortable, with a good ride, even on huge 21-inch alloys. This remains the case even when you play with the different suspension settings: Comfort, Sport, and Sport Plus. You can also select another Sport setting to provide a more responsive throttle. If you combine Sport Plus Suspension with Sport throttle response and choose to change gear manually using the steering wheel-mounted paddles, you end up with a highly enjoyable driver’s car. 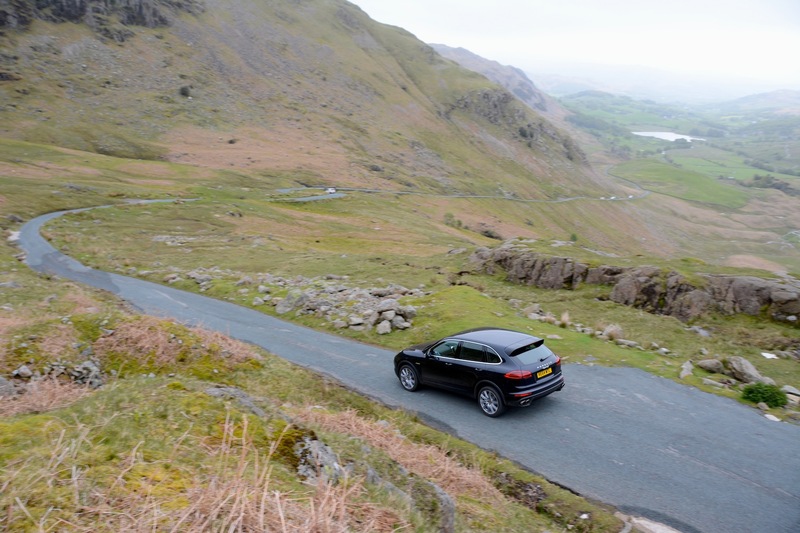 This isn’t to say that leaving the transmission in auto is problematic – it isn’t, but for the ultimate enjoyment on twisting, hilly roads such as in the Lake District, manual control of the gears just provides that extra dimension of interaction and control. So the Cayenne is excellent to drive on the road, but it has another trick up its sleeve. 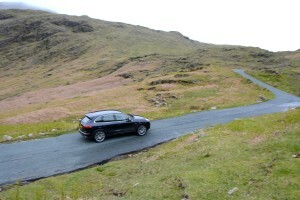 Even though it’s hard to imagine when you’re pressing on along a B-road, the Cayenne can also go off-roading. Unlike some rivals, there’s no range of different off-road driving settings, but you can raise the ride height. 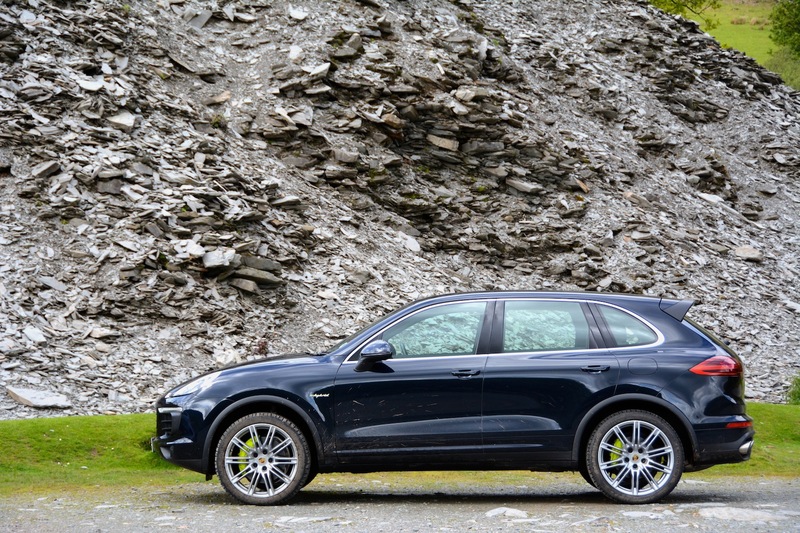 This is actually very useful, and during our mild off-road test the Cayenne proved itself to be a lot more capable off-road than its on-road behaviour would suggest. 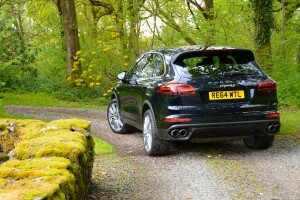 However the Cayenne is ultimately limited by its tyres, which, like the car, are on-road rather than off-road biased. In terms of the petrol/electric drive options, there are two buttons: e-power and e-charge. E-power is essentially a hybrid mode, with the focus on electric propulsion. 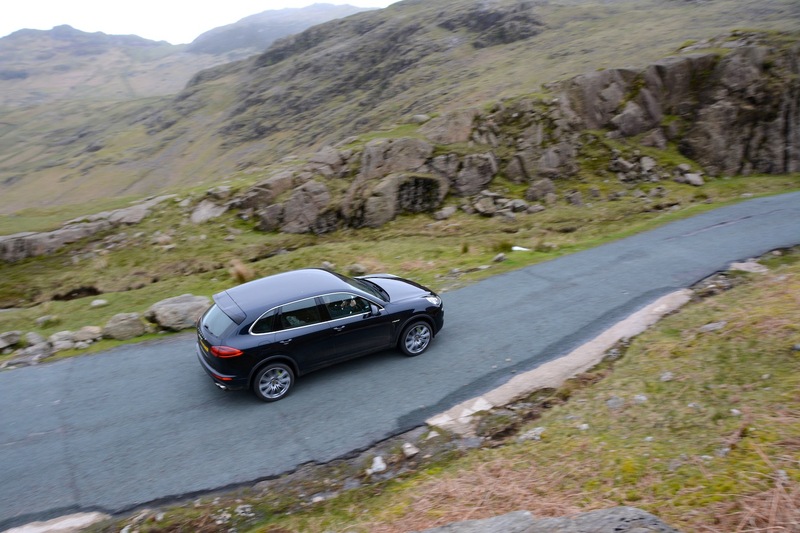 When there’s no load on the engine, including on motorways, the Cayenne can coast in electric mode, with the petrol engine switching itself off. E-charge enables you to charge the battery using the petrol engine. We really have very few complaints about the Cayenne S Hybrid, but in our humble opinion it would be better to have four driving mode options, as many rivals have: pure electric power, hybrid power, hold, and charge. 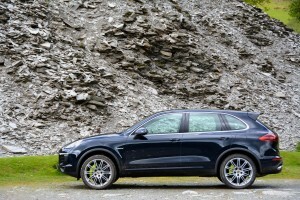 In other words the Cayenne is lacking an option to select pure electric power, and to us the big omission is the lack of a hold mode; you can charge the battery using the petrol engine, but you can’t choose to simply retain the charge if it is already fully charged from the mains (a more efficient way of charging the battery compared to using the internal combustion engine). 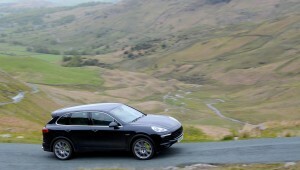 The official NEDC combined economy figure for the Cayenne S Hybrid is 83mpg. 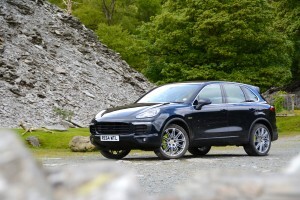 This sounds ridiculous for a Porsche SUV weighing the best part of two and half tonnes – which it is. 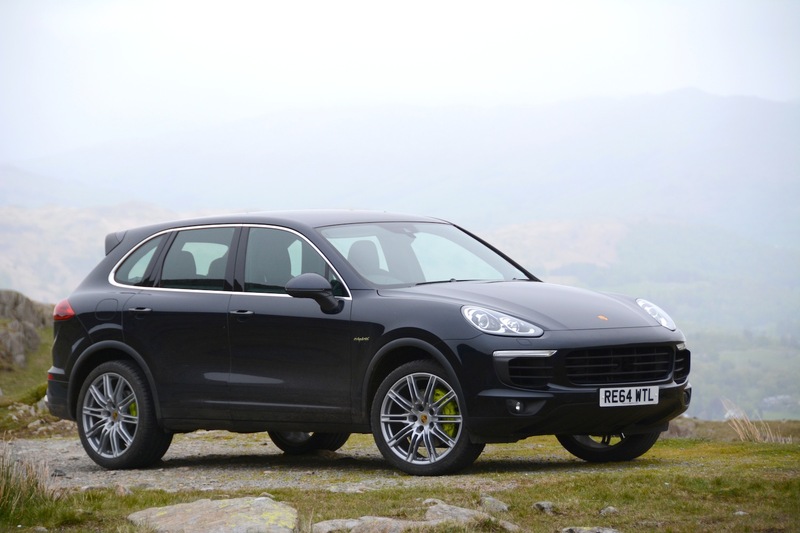 The Cayenne S Hybrid needs our standard plug-in hybrid health warning: If your driving patterns match the NEDC test cycle then you may enjoy 80mpg+. If, like everyone we know, your driving doesn’t match this cycle, then you won’t enjoy 83mpg. 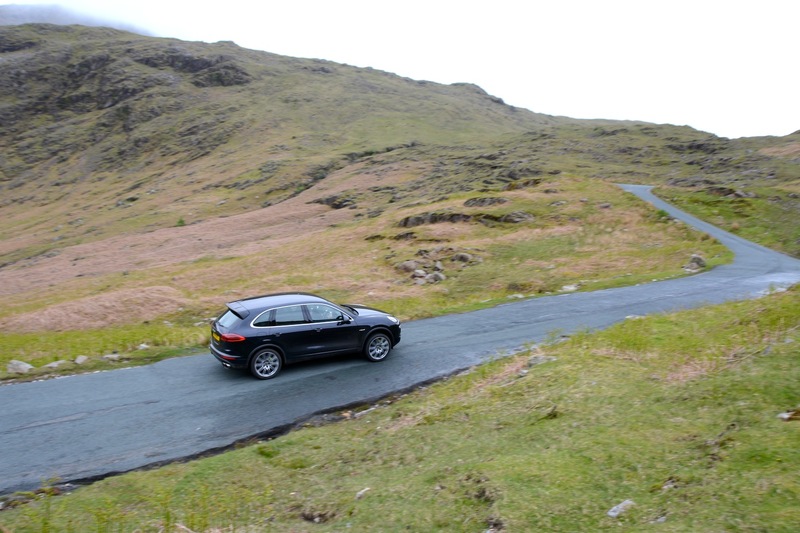 During our week with the car we undertook three long journeys – over 300 miles in total – and a number of shorter journeys. Many of the shorter journeys were carried out purely on electric power. 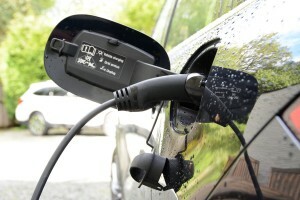 The economy that an owner will achieve in real life is based completely on how much electric driving they can do. Overall we achieved an average of 39.5mpg over a one week period. 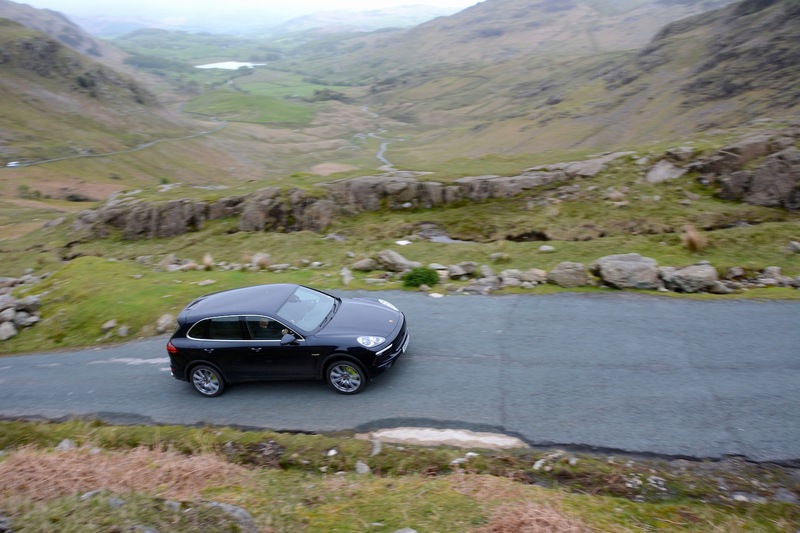 We’re pleased to say that we managed to drive the car in the way that Porsche intended for much of the time, so managing 40mpg is in our view is an excellent achievement. In terms of the electric range, although this should be 22 miles according to the NEDC figures, we were only managing 12-15 miles of electric driving range in real-life driving. However this was in the hilly environment of the Lake District, and driving for 15 miles in a Porsche Cayenne on purely electric power was a fantastic feeling, and many heads were turned as a completely silent and zero emission Porsche 4×4 glided past. The Cayenne S Hybrid takes around three hours to charge using a standard domestic socket, or around half that time using a 7.2 kW wallbox. 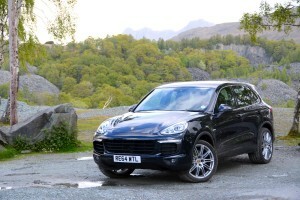 The basic price of the Porsche Cayenne S Hybrid is £61,474. However, as our test car shows, it’s easy to make this a lot more expensive by adding options. Our test car had the following options: Moonlight Blue metallic paint (£720); Full leather interior in Black (£2,177); Air suspension and self-levelling ride-height (£1,328); Automatically dimming exterior and interior mirrors (£243); Adaptive Cruise control with Porsche Safe automatic braking function (£1,287); Porsche Communication Management 3.0 including navigation and Jukebox function (£2,307); Speed limit recognition (£283); DAB Digital radio (£324); 21-inch Cayenne Sport Design alloy wheels with wheel-arch extensions (£2,796); Bluetooth telephone module (£534); Porsche Dynamic Lighting System (PDLS) (£608). That brings the total price to £74,801. From taking a look through these options and their costs you can see how Porsche makes good profits. 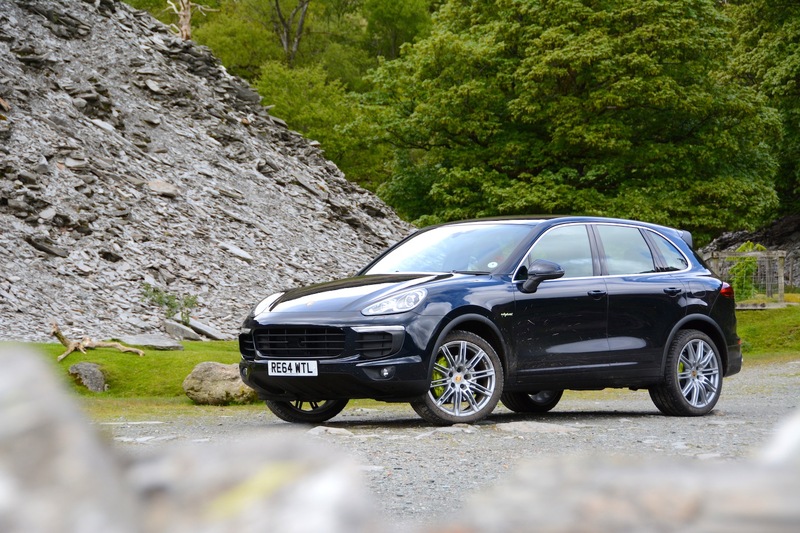 The Cayenne S Hybrid has a very low BIK rate of just 13%, so it should appeal to company car drivers who have generous allowances. Running the hybrid rather than the diesel Cayenne could save 40% taxpayers many thousands of pounds per year on their tax bill. However one big issue is that the Porsche Cayenne S Hybrid, with its 79g/km CO2 emissions, falls just outside of the 75g/km limit for the government’s £5,000 plug-in car grant, and the 75g/km London Congestion Charge exemption threshold. It also just falls outside the 75g/km BIK tax band, knocking its BIK rate up by 4%, from 9% to 13%. We really hope that Porsche’s engineers are working on this issue right now. The Porsche Cayenne S Hybrid offers a Porsche driving experience, off-road ability, lots of space, and the potential for around 20 miles of zero tailpipe emission electric driving. For us, this comes very close to the brief for the ultimate car that is currently on sale. On the downside, it’s not exactly cheap to buy, and it just misses out on eligibility for the government’s £5,000 plug-in car grant as well as exemption from the London Congestion Charge, and a lower BIK band. We would also like to see driving mode options for pure EV and for holding charge. 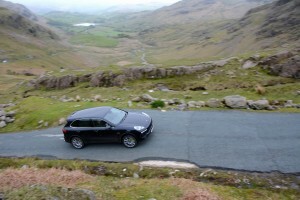 But overall this is a highly impressive car to drive, and if your driving patterns are such that you could complete a decent proportion of miles per week on electric-only power, helping with local air quality issues as well as saving money on running costs, then this car could make sense for you. 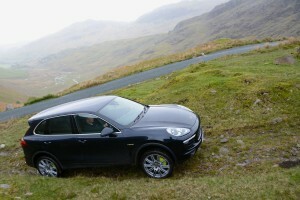 On this basis the Porsche Cayenne S Hybrid is awarded a Green-Car-Guide rating of 10 out of 10.